Continue for a chance to win a free shoot with YRBK. Celebrate your year with YRBK. YRBK is available in Delaware and neighboring states. You must register first to schedule your portraits. YRBK is a local family-led portrait service with a passion to be the most unique and specialized portrait service for students in the community. At YRBK we photograph your natural look and personality in multiple modern styles with fashion magazine quality. We invite students to be creative with their poses, wardrobe, and expressions. Students can bring props, small custom backdrops, and an assortment of outfits. We take the pressure off by allowing friends to schedule shoots together and by taking a variety of portraits in a short time. Keep reading to learn more and see samples of real students in the community. Get portraits like no other by being like no other. At your YRBK shoot, you are free to be yourself and we encourage you to have your own ideas. If you're shy or unsure of what to do, our photographer will provide direction to help you get a great portrait. YRBK is for students who want to celebrate who they are today. prints and a personal magazine of your entire shoot. There are many looks and styles you can do during your portrait shoot. You'll have many portraits to choose from when selecting prints. Your personal magazine features all of your photos from your shoot. Have fun at your shoot and be yourself. Order your prints online from your private gallery. YRBK offers location shoot packages in addition to studio packages. Location shoots are first-come first-served due to limited shoot dates. Hurry and register before it's too late. Limited spots available. No payment required to register. Magazine-style photo-shoots for students by photographers with editorial and fashion experience. Each year our creative team of photographers and portrait testers work together to create new looks and styles that all students get to use for their YRBK portraits. 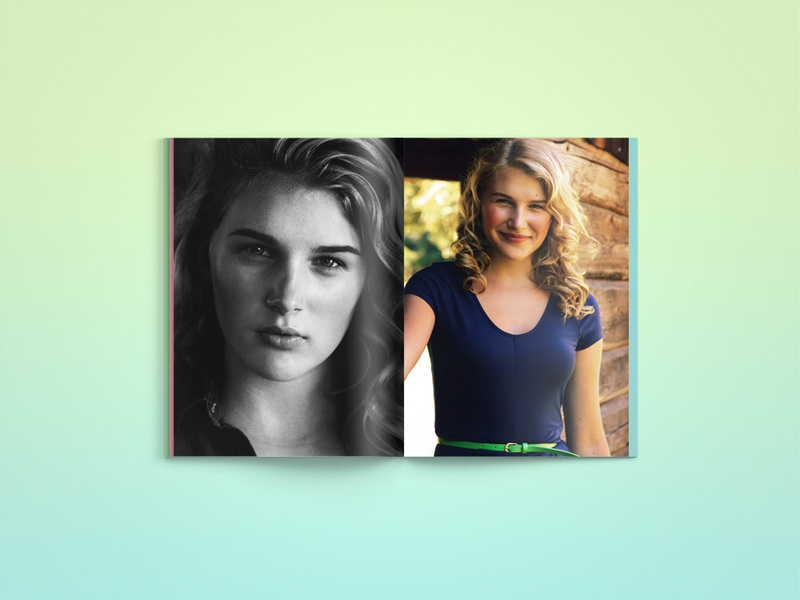 One portrait style doesn't fit all, so at YRBK you get to do different styles as part of your package. You can even do more styles depending on your package. More style options, combined with the ability to bring your own custom backdrop and a variety of outfits, means you'll have a lot of different portraits. So What is the magazine exactly? The YRBK Magazine is a beautiful personal magazine that showcases all of the photos from your shoot. If you do more than one YRBK shoot you can include them all in your magazine. These unique keepsakes make a great portrait album to keep on your parent's shelf at home or bring with you to college. You can polish up your magazine by purchasing a fully retouched version, or you can keep the original magazine to serve as proofs before you order any high-resolution prints. Full page photos and beautiful color. Your magazine can be personalized further by including a small summary of your year and accomplishments. Your magazine features you being you, wearing what you like. Our portrait styles are tested for a variety of students and their talents, from athletes and dancers to actors and band members. You can order multiple copies of your magazine to share with parents, friends, and family. Your YRBK Magazine is personalized for you. Pose how you like, wearing what you like. Try YRBK for your school or senior portraits. Discover a variety of new styles and customization while shooting with our professional photographer. YRBK Magazines are the perfect way to celebrate students each year. These beautiful portraits capture you in professional quality with your own personal touch. See yourself in a different light with a variety of styles during one session. Prints and magazines are to see, hold, and share. YRBK portraits are printed large, in color, and in beautiful 50 page magazines. Individual prints are in high resolution on photo paper perfect for framing. Choose from many portraits to frame and fill your home. To ensure you end up with prints in your hand, every student who does a YRBK portrait session will receive a copy of their YRBK magazine, as well as a starter print credit. Customize your Cover, backdrop, Props, makeup, costumes, and more. Do something that makes your YRBK shoot more fun and personal. With every YRBK package, you'll receive tips and guidelines for customizing your shoot. This will include custom backdrop dimensions and how to prepare for your shoot. Add more to your magazine. Add a mini bio of your achievements, notes from friends or family, and even your favorite selfies or photos. Our backdrops are handmade and designed for professional fashion shoots and actor head-shots. Traditional fashion backdrops are provided by YRBK. We also often create new backdrops from year to year based on trends and requests from students. If you have an idea for a backdrop, we can provide you with the required dimensions and tips necessary for a good portrait. You'll find a lot of creative inspiration and tutorials online to help you create something unique. Don't skimp on your idea, your idea could win a cash prize from YRBK. Create a backdrop with a friend and schedule your shoots for the same time. Think about using paint, glitter, faux leaf walls, collage, graffiti, vintage wallpaper, painted wood, patterns, abstract, scenes, stencils, hanging fabric, illustration, or anything else you think would make you stand out. Register for YRBK to get your invitation! Pictures wearing what YOU like. At YRBK you can wear whatever you like. This is one of the fun aspects of YRBK and a key part of showing who you truly are in your portraits. There is a designated area in the studio for changing, applying makeup, and adjusting your hair. We provide tips based on your package, skin tone, and our current lighting and backdrop styles. Bring your favorite outfits to YRBK regardless of the season. Bring a school or band uniform. Bring a cap and gown. Join the other students already registered. If we reach our registration goal, we'll add more to YRBK packages. You'll also save $100 by registering now. Peter and Sarah are the heart behind YRBK. They have an incredible story filled with love and friendship dating back to high-shool. They met when they were children and grew up in Delaware. Recently they celebrated 10 years of marriage and they reside in Wilmington with their children. Peter is a professional portrait photographer who began his career on the west coast as a fashion photographer. He also found a love for photographing weddings and events. In college Peter studied fine arts including painting, drawing, figure study, art-history, design, illustration, and color theory. He loves meeting new people and families and taking portraits they can enjoy for years to come. His work embodies people who want to look their best for personal portraits, portfolios, and celebrations. He currently photographs pregnancy, beauty, fashion, headshots, weddings, VIP events, and musicians. Peter is one of the lead photographers for YRBK. If you're a student and interested in working as a photographer with YRBK, you can apply by emailing us your resume along with a link to your portrait work (please include as much of your work as possible). Committed to encourage individuality and being yourself. We want to inspire confidence and positive self image. YRBK is there to chronicle the amazing students in our local community who are ready to carve their own path in life. We believe YRBK is unique and the only studio of it's kind. It involves so much more than a traditional portrait. Sign up for your first YRBK by Aug 2017 and you'll receive $100 off at the time of shoot and $100 off each additional year you do YRBK. That means if you're a freshman, you'll get YRBK at the same discount every year you're in school including your senior portraits. Early signups will even get 50% off for family members including parents for shoots like headshots, portraits, home sessions, and more. No payment required to register. Portrait invitations will be sent to students registered with YRBK. YRBK portraits are by invitation only. Registration is open to high-school and college students in DE, PA, MD, and NJ. YRBK studio is located in Wilmington, DE. You must schedule an appointment. We do not accept walk-in traffic. We're currently looking for YRBK ambassadors to help us register more students. Share YRBK with your friends and follow us online. Help YRBK to reach more students in the community by sharing a link to our site and social pages. YRBK studio and location portraits © 2017 YRBK or YRBK photographers.